Ideal for reading presentations, which require no support equipment. Height adjusts from 30" to 44". Reading platform tilts from flat position to 70°. Paper stop keeps materials secure at all viewing angles. Wood laminate top with black T-molding. Black steel base with floor levelers. 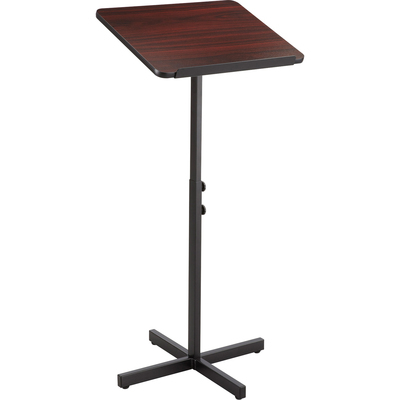 Speaker podium ideal for presentations requiring no support equipment. Podium height adjusts from 30" to 44". Reading platform tilts from flat position to 70°. Paper stop keeps materials secure at all viewing angles. Designed with wood laminate top and black trim. Features steel base with floor levelers.